Warehouse Dollies, Trucks, and Carts fabricated in the USA by EGA are dependable, rugged, and move with ease. 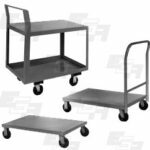 Rigid frames, all-welded construction, and sturdy steel decking makes these trucks, dollies, and carts ideal for warehouses or any shipping and receiving or production operations. 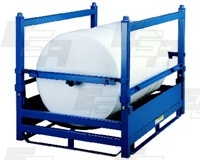 They are available in many different types and sizes to accommodate most applications. 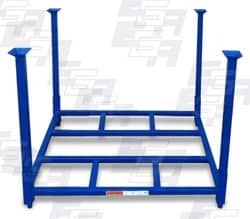 If you don’t see one that will suit your needs, contact us and we can custom design and custom fabricate a dolly, truck or cart to fit your unique needs. Construction Features 1,000, 2,500, and 3,200 lbs. capacities. 14 gauge deck and shelving standard. Two rigid and two swivel ball bearing casters in standard in 5″, 6″ and 8″ sizes. Gray enamel finish. Options Four swivel casters. 2″ lips up or down on shelves. Colors. Handles on one or both ends. 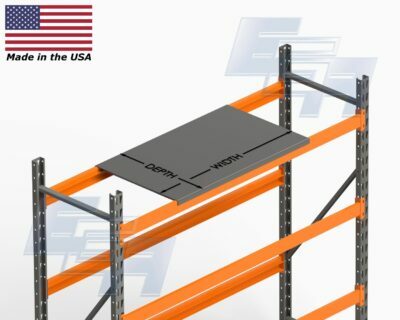 MADE IN USA – EGA Products is a world-class manufacturer of American Made carts, dollies, rolling ladders, and more that are designed to take on demanding industrial environments. 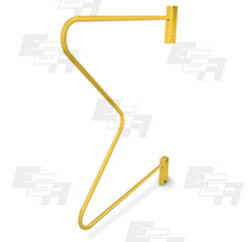 Every item in the EGA product line, big or small, has been conceived through customer need. Warehouse ladders, dock ladders, work platforms, step stools, and more have been sourced through a design to suit mentality. SOLUTION CRITERIA – Customized solutions are what sets EGA apart. Where other competitors in the same space import their materials and some of their products, EGA has remained steadfast in their pursuit of a fully American made product line. This not only enables the best quality goods but also enables the ability to design and build on-demand and as needed. Some items are so popular, they are ready to buy now. YOU GET WHAT YOU PAY FOR – like all EGA Products, unbeatable American craftsmanship is an added bonus to these dollies, trucks, and carts. At EGA Products, hiring the best welders, machinists, and skilled tradesmen has paid off. In a world dominated by importers, EGA has held its own because it doubled down on a strategy to offer completely American Made material handling goods. Why? It matters to EGA, and it matters even more to their clientele.